Used in pairs. Sold separately. 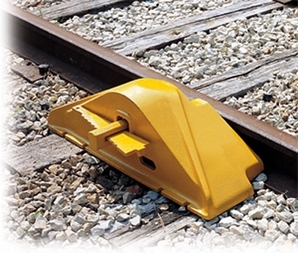 Double-ended "Burlington-Style" rerailers are locked to the rails by clamps and wedges and will not slip or kick out during rerailing. One Inside and one Outside make a pair. Rerailers are reversed in direction and exchanged in position to suit different derailed wheel situations. For use with standard size cars. • Rail size: 100-140 lbs.